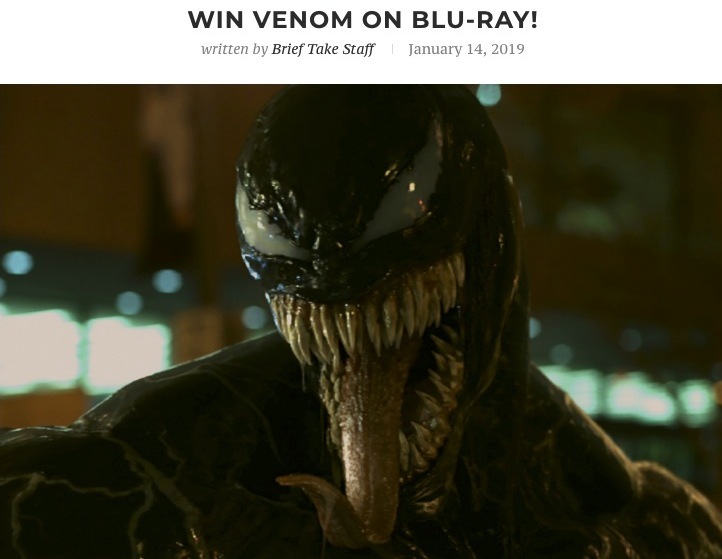 Brief Take just published a new Twitter contest, in it, you have the chance to win Venom on Blu-ray combo pack. The entry for this contest is open only to legal residents of Canada who have reached the age of 15 years or older. To enter the contest you must log into your Twitter account and visit the official Brief Take Twitter Account and follow it, then you must re-tweet the competition post. For a bonus entry you have to follow the official Brief Take Instagram account. This contest closes on January 19 2019. Winners will be randomly drawn among all entries. There will be one prize available to be won consisting of a Venom Blu-ray combo pack. The entry for this contest is already on the run and will end on January 19 2019. The draw to select the winner will take place after the close date. Winners will be notified via direct message on Twitter.